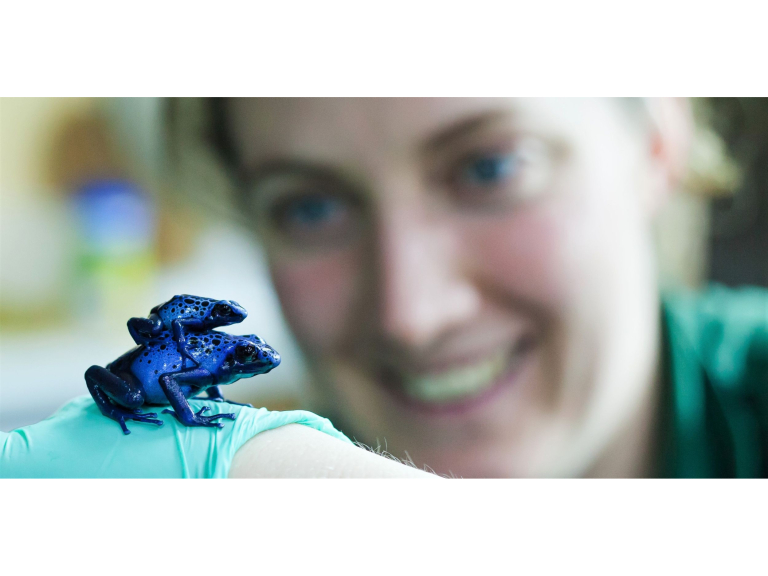 Paignton Zoo keepers have bred a species of blue frog for the first time. And it’s a success that the charity’s founder would have approved of whole-heartedly. The blue poison dart frog (Dendrobates tinctorius azureus) is usually found in the forests of southern Suriname and northern Brazil, but can now be seen in Paignton Zoo’s Reptile Nursery. The man who founded Paignton Zoo nearly a century ago, eccentric millionaire Herbert Whitley, was obsessed with the colour blue. Zoo spokesperson Phil Knowling explains: “He wanted to breed the colour blue into dogs and pigeons because it was rare and special – he also cultivated several plant species with blue flowers. The blue poison dart frog is a small amphibian with a big attitude. Its bright blue skin warns off predators. If that’s not enough, it secretes poisonous alkaloids which can paralyse or even kill an attacker. Luckily for keepers, frogs in zoos lose their toxicity because of their different diet. They don’t need any special husbandry measures, though as they are larger than some dart frog species, they need more room. They can, however, be tricky to breed. Katy: “I have found that having one female with a group of males works really well, the males don’t seem to fight much over the female - they are so food orientated they just care about eating! “We spray them with water regularly and supply a good layer of leaf litter - they tend to breed once I add in fresh leaf litter and they discover a good egg laying spot.” A fascinating fact is that the pattern of black spots and specks is unique to each frog, meaning that individual frogs can be identified. The blue poison dart frog, unlike so many of its class, is not considered to be endangered, but Paignton Zoo has never bred it before. Also known by its local Indian name of okopipi, adults weigh no more than about 8 grams and may be three or four centimetres long at the most. The blue poison dart frog breeds seasonally, usually in the rainy months of February and March. The males sit on a rock and call until the females track them down. The females then fight over a male. Up to ten offspring can be produced. Eggs are laid in the male’s territory, and he takes care of them, sometimes with the help of the female. The eggs hatch after around 14 to 18 days, and the tadpoles metamorph between 10 and 12 weeks. They can live up to 6 years in the wild and about 10 years in zoos. Paignton Zoo Environmental Park is a registered charity. For more information go to www.paigntonzoo.org.uk or ring 01803 697500.